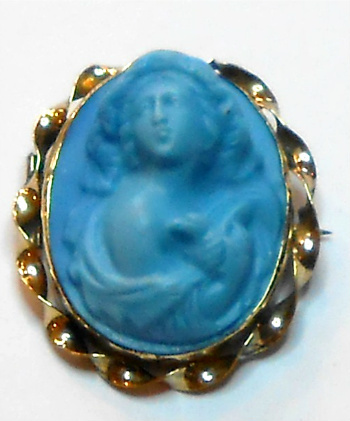 The muse invoked describes a French Antique Cameo making method, practiced in Tours in the early 20th century. Rising with Aurora's light, goddess of the dawn, leads the sun god Apollo on his chariot at break-o-day, bringing daylight to the world and shedding light on a bizarre French Antique Cameo making modus operandi that started in the early 1900s, in Tours, in France. In this region of France, a rare form of Cameo Jewelry making, had commenced hundreds of years. Tours is a picture-perfect, quaint, historic French town with a population of around 130,000, located approximately 135 miles southwest of Paris. The superior cameo of high quality that was produced in Tours was due to the unusual method of its making. This method is no longer practiced today because of the very long length of time it takes to produce just one of these rare cameo beauties. In the history of the cameo made in Tours, it is the magic of water from two rivers that weave through the city that tell the tale. Like the mix of warm and cool waters of the Persian Gulf that have played womb to beautiful Persian Gulf Pearls. The River Loire and the River Cher, both flows through the town and the cliffs above the River Cher between Tours and Savonnieres are lined with prehistoric grottos. (A grotto is a small cave, usually of great natural beauty or unusual in appearance). This French antique cameo is formed by the natural action of water dripping in the grottos. The rate of stalagmite growth varies according to the amount of dripping water, the limestone type, and the evaporation rate of the carbon dioxide. At best, it is about 7/16 inch per 100 years! At its fastest, the thickest cameo known to be produced in this manner would have taken at least 125 years to form! An Antique cameo in the truest sense. No craftsman who created a matrix and placed it upon a post would live to see the fruits of his labor so very few people had such conviction. A matrix (mold) was carved intaglio to give a proper shape or form to material introduced into it. The matrices were made from papier mache-and were placed upon short posts in places where water was dripping from the ceiling. After a number of years, they were filled with the lime and minerals in the water, and at long last, the cameo was formed. A finishing touch-up to the carving was done to reach their final beauty, producing a genuine Antique cameo of priceless value. Lucky viewer, if you have acquired such an Antique cameo, from Tours France, created through this unique process, described above, do make a Jewelry Investor and Cameo Collectors day; share the story of your French Cameo Beauty by submitting a post in Your Favorite Jewelry or on the Antique Cameo Forum. Zeitner, J.C., Lapidary Journal 'Color Basic to Carving' February, 1988.